Mr. Allan Halter, Manager of Wetaskiwin Co-op, will be getting another set of keys on April 22nd, 2014 when the former Sobeys store at 4703 – 50 Street becomes the new Co-op grocery store. Halter is looking forward to this new challenge. After 5 years of managing and growing the Wetaskiwin Co-op, he can now put his 25 years of experience in the food retail business into good use to launch the new store. In the original deal with Safeway announced last June, 2013, Nova Scotia-based Sobeys purchased 213 stores. Sobeys was required to sell 23 stores as part of an agreement with the Competition Bureau in connection with its $5.8 billion purchase of Canada Safeway. 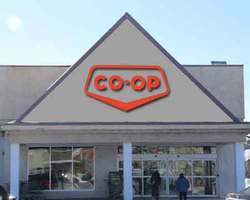 Federated Co-operatives Limited (FCL), on behalf of the Co-operative Retailing System (CRS), has entered into an agreement to purchase 14 food stores from Sobey’s Inc. Sobeys at 4703 – 50 Street in Wetaskiwin will become Wetaskiwin Co-op and Sobeys at 5421 – 50 Street in Leduc will become Leduc Co-op. Wetaskiwin Co-op will be taking over about $700K in inventory from Sobeys. Although the Co-op looks like any other local business the stores are owned by Co-op members. Savings generated by the Co-op are returned to member-owners, proportionate to the amount purchased from the Co-op during the year. Wetaskiwin Co-op returned more than $2.3 Million dollars to members in cash in 2013 and in the last five years the Wetaskiwin Co-op has returned $5 Million in cash to its members. A $10.00 lifetime membership fee allows members to share in ownership and the disposition of surpluses from the sale of goods and services. The first settlers to the Wetaskiwin region envisioned a store that they could rely on for their every need. At that time they needed commodities like salt, flour, sugar, apples, feed, seed grain, and binder twine. In the beginning, the bulk of the business was conducted on a railway spur at the box car door. Local members were notified that their supplies had arrived and farmers would call at the box car to pick up their orders and sometimes their neighbours' orders as well. The new facilities and the many achievements of the Wetaskiwin Co-op would be an impressive awe-inspiring site for the old-timers to see. Since the purposeful beginning in 1917 the Wetaskiwin Co-op has evolved and now offers over 50,000 items and approximately $2B in inventory. Rural and urban customers alike, have access to the home centre, a huge building supplies facility, garden centre, bulk petroleum operations, hardware, tools, gifts, clothing, and flooring…. and now groceries in the former Sobeys building. As peoples' needs changed over the years, so has the Co-op.